The Intelligent Homosexual’s Guide to Capitalism and Socialism with a Key to the Scriptures. (l to r) At Berkeley Rep, Mark Margolis (Gus), Tina Chilip (Sooze), and Joseph J. Parks (Vito) in Tony Kushner’s “The Intelligent Homosexual’s Guide to Capitalism and Socialism with a Key to the Scriptures.” Photo courtesy kevinberne.com. There is a phantom haunting the theater—the phantom of socialism. Look to the Bay Area theater scene, and you’ll notice an array of socialist playwrights and subject matters: Berkeley Rep just opened The Intelligent Homosexual’s Guide to Capitalism and Socialism with a Key to the Scriptures, its second definitively radical show, after Dario Fo’s Accidental Death of an Anarchist. All of California Shakespeare Theater’s non-Shakespeare shows this season were written by socialists (Lorraine Hansberry’s A Raisin in the Sun [read our review] and George Bernard Shaw’s Pygmalion). The (Tony-winning) San Francisco Mime Troupe is avowedly far-left, but then they’ve always been. Remarkably, Shotgun Players just wrapped up a trilogy of Tom Stoppard plays about obscure Russian radical Alexander Herzen, “the father of Russian socialism” (I am unsure which is more shocking—that they decided to put up the entire trilogy, or that Stoppard’s yawn-worthy dialogue resulted in the trilogy’s run being extended). Why do we love socialist playwrights so much? Clearly, it’s not their politics; a majority of Americans still have a negative reaction to the word “socialism.” Still, we seem to find watching them amusing; Intelligent Homosexual’s Guide is built around the premise of far-left radicals in dialogue. 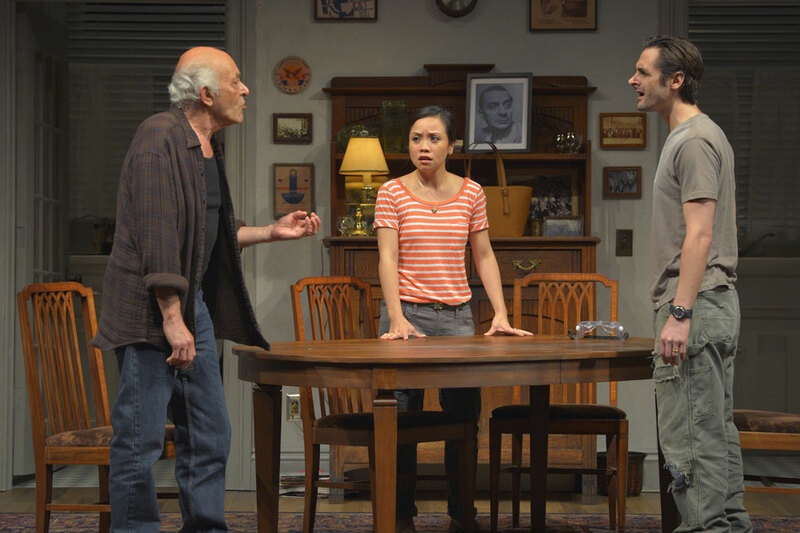 The play centers around Gus (Mark Margolis), the ultra-left family patriarch and former CPUSA member; for most of the show, it’s him sitting at the dining room table with his family encircling. Gus wants to die; his children have found out, and are trying to talk him out of assisted suicide. The sons shout at dad, dad shouts back; the characters are individualistic, intellectual and political, and hearing them bicker is like sitting in for dinner at Norman Mailer’s house. Indeed, the banter in this show is quick, intelligent and simultaneous—never have I seen a show with so much cross-dialogue, so many people talking at once, something the art of theater can achieve much better than film or even literature. The bombardment of left politics and family drama raises an interesting question: if Americans like watching socialists on stage—even for three hours and forty five minutes (seriously)—why do we hate on socialists so much? The cheeky plaques on the bathroom walls at Berkeley Rep (which always hold cute facts related to the play in production) point out that the Communist Party USA had tens of thousands of members at its height, and now only has two thousand. The night I attended, the 600-seat house was sold out; if it’s like most Berkeley Rep productions, all forty-odd Intelligent Homosexual’s Guide shows will be near-sold out, too, meaning that by the end of the month around 24,000 people will have seen the show; that is, 24,000 people will have sat in downtown Berkeley for almost four hours, watching dyed-in-the-wool radicals duke it out over obscure leftist history, divinity and sexuality; indeed, a full twelve times as many people will see this play as are in the Communist Party USA (whose waning membership seems like the target audience). Why do 24,000 people pay hundreds of dollars to sit, listen and watch shows about the far left? Why do we like listening to the left, seeing inside their lives—to an anatomical degree—even if we don’t like to join ‘em? I think this may have to do with the left’s overall vision. Clearly, the average American doesn’t believe communism will work—but probably, deep down, still wishes it would work. The idea is utopian and wonderful—even the grumpiest Hoover Institute philosopher will admit this. This is something the right will never have: nationalism and fascism are retreats inward, racialized visions based on exclusion—of class, ethnic or lifestyle groups. The left speaks to our dreams, our real utopias—futures without all the oppression (race, class, patriarchy, poverty) we suffer through. 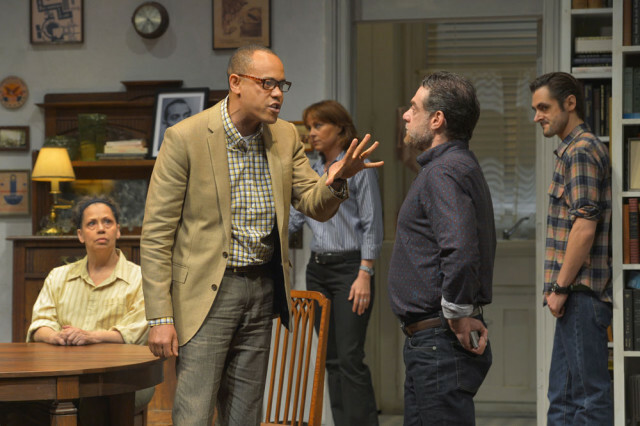 (l to r) At Berkeley Rep, Randy Danson, Tyrone Mitchell Henderson, Deirdre Lovejoy, Lou Liberatore, and Joseph J. Parks in Tony Kushner’s “The Intelligent Homosexual’s Guide to Capitalism and Socialism with a Key to the Scriptures.” Photo courtesy kevinberne.com. We live in a world of constant media consumption; between television, live performance and the Internet, it’s almost like there’s been declared a war against boredom. Still, Cold War-era anti-communist hegemony is strong; the dominant American narrative about the left could best be described as: “socialism, while good in theory, just doesn’t work.” This is the kind of thing that you can believe while still watching a play about a socialist family, without feeling cognitive dissonance; deep down, all of us want communism to work, regardless of what we hear about it. Besides a few skinheads, we want to live in an egalitarian democracy, where jobs are plentiful, the workweek short and poverty nonexistent. In recessionary times, we may feel this more acutely; it is certainly true that entertainment consumption goes up in a recession (as do liquor and candy consumption). Presumably, people seek escape from their problems. Sensibly, political daydreaming is a form of escapism; even if at the end of the day we’re told that such a dream is impossible, it’s still pleasant to dream. Watching the leftist repartee of Intelligent Homosexual’s Guide or Accidental Death of an Anarchist immerses us in another world—much like watching Star Wars or Harry Potter and becoming immersed in their worlds. As forms of art, they are “safe” to the capitalists and banks who underwrite the plays at Berkeley Rep and whose ads litter their Playbill: for we can no more easily walk into Hogwarts than we can into a socialist utopia, no matter how many times we watch the play. If you enjoyed this review, check out more of PopFront’s cultural pieces. This entry was posted in Culture, Politics, Reviews, Theater and tagged bay area, berkeley rep, berkeley repertory theatre, intelligent homosexual's guide to capitalism and socialism with a key to the scriptures, radicalism, socialism, theater reviews, theatre reviews, tony kushner, tony taccone on June 15, 2014 by Jesse Hryhorowych.